I'm moved in and mostly unpacked (just don't look in my office or under any backroom tables). Red Lodge Montana now has a Quilt Lodge, and we're open for business. I've had a number of locals and travelers stop by to wish me well. I'm pretty terrible with names, but I remember faces and stories. There's a lot of stories in the Quilting community. Some stories are about quilt meetings, history, projects, local people and get together's. I think that besides quilting, my favorite activity is listening. 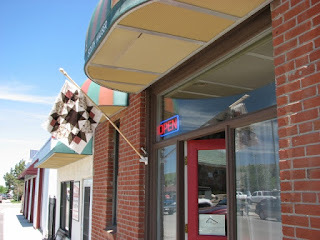 I've had a number of visitors who have never quilted but wanted to stop in and share their quilt history. It's amazing how many people have a fond memory of a family quilter, and a favorite quilt. One group of travelers today wanted to share a particular story about a short term homeless woman who gathered a bunch of shirts that were cast off from a clothing bag. She had a bit of time on her hands while she waited for a better living situation, so she started cutting and sewing, by hand! She made a beautiful twin size quilt for the shelter in a matter of two weeks. The activity inspired a few others to start cutting and sewing; then someone found a sewing machine, then the iron came out, well, you know what happened after that. The quilting activity was a bonding event, not lost on the social workers, who related this story to me. "Quilting is psychotherapy" they told me. I've known this for years, and the saying never goes out of style.